I’d like to tell you about a rare genetic disease that’s very close to my heart: Hutchinson-Gilford progeria syndrome, also called progeria. Though you may not recognize the name, you may well have seen pictures of children with this fatal premature aging disease. By 18-24 months, apparently healthy babies stop growing and begin to lose their hair. They develop wrinkled skin and joint problems and they suffer many other conditions of old age. Though their mental development is entirely normal, they often die of heart disease or stroke by age 12 or 13. A decade ago, my research lab helped discover the cause of progeria: a mutation in the lamin-A gene . Just a single letter substitution in the genetic code (C to T) creates a toxic version of the protein. The abnormal protein is missing a segment, and is no longer digestible by an enzyme called ZMPSTE24—essentially a molecular scissors. Without that final snip, the lamin-A protein causes molecular havoc.More recently, children who are completely missing the ZMPSTE24 enzyme have been identified, and they have an even more severe form of progeria called “restrictive dermopathy”. Many questions remain but now we are able to get a close up of ZMPSTE24 and understand how, and where, it normally modifies lamin-A. Source: Courtesy of Liz Carpenter, University of Oxford. 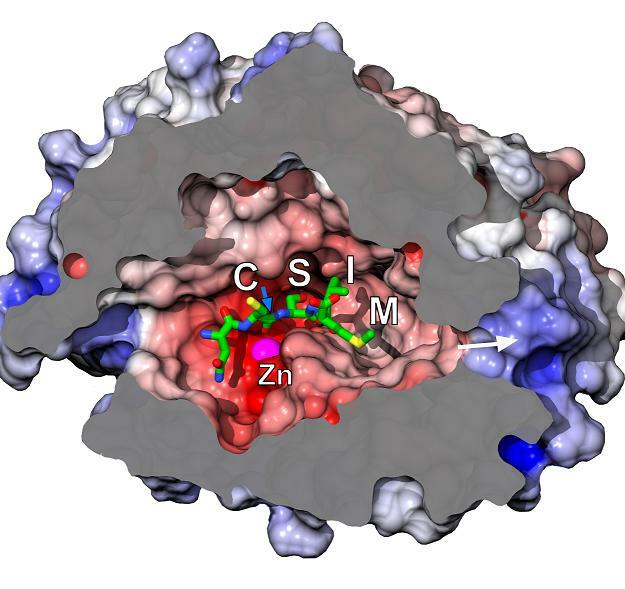 Using x-ray crystallography, a team based at the UK’s University of Oxford figured out the enzyme’s molecular structure [2, 3]. A cross section of the 3D structure (seen above) reveals a cavernous inner chamber where the authors believe the final snip of lamin-A takes place. It also shows us how mutations in ZMPSTE24, which inhibit lamin-A processing, can also lead to these rare aging disorders. Knowing ZMPSTE24’s structure will help us better understand its clipping functions. It could also shed light on how this enzyme works in the normal aging processes—as well as in the accelerated aging of progeria. Ultimately, we hope it will also inform drug development for this devastating disease. Recurrent de novo point mutations in lamin A cause Hutchinson-Gilford progeria syndrome. Eriksson M, Brown WT, Gordon LB, Glynn MW, Singer J, Scott L, Erdos MR, Robbins CM, Moses TY, Berglund P, Dutra A, Pak E, Durkin S, Csoka AB, Boehnke M, Glover TW, Collins FS. Nature. 2003 May 15;423(6937):293-8. Epub 2003 Apr 25. The structural basis of ZMPSTE24-dependent laminopathies. Quigley A, Dong YY, Pike AC, Dong L, Shrestha L, Berridge G, Stansfeld PJ, Sansom MS, Edwards AM, Bountra C, von Delft F, Bullock AN, Burgess-Brown NA, Carpenter EP. Science. 2013 Mar 29;339(6127):1604-7. Biochemistry. A protease for the ages. Michaelis S, Hrycyna CA. Science. 2013 Mar 9;339(6127):1529-30. This is the first time that I’ve gotten detailed information about this topic. Thanks. Such a terrible and devestating disease. Would be wonderful if a treatment could be developed. Good article. So interesting how such minute differences manifest in such different ways. As you know our boys have a mutation of the zmpste24. We feel so blessed that you do have a special place in your heart for children with progeria. We really hope to have the opportunity to meet you some day! A scary disease. You gave me a lot of useful information. Thank you!